Into the Black burst onto the Southern California haunt scene in 2017, and it quickly shattered some of the long-running standards we’ve come to expect from haunts. Gone were the conga lines and large groups of people spoiling the scares, because in this maze, you had to walk through alone. And yet, it wasn’t an extreme haunt but rather one that packed plenty of scares but could still appeal to even casual haunt-goers. We were sure Larry Bones had found the right formula for something really unique, and we gave Into the Black a 666 rating last year. 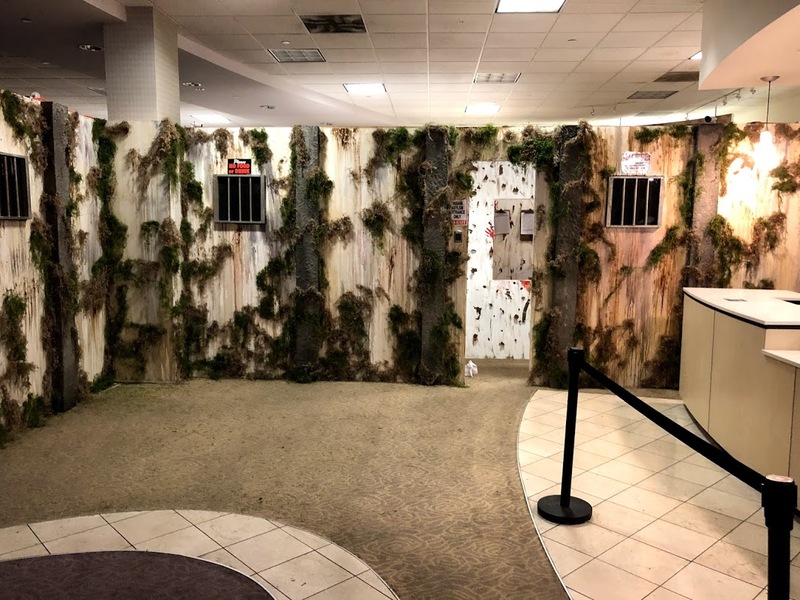 This year, Into the Black makes up just one of three mazes in the newly expanded, multi-haunt event called HorrorWorld, located in the Puente Hills mall in the City of Industry. We were able to experience all three haunts during a media preview event before the official opening. Read on for our reviews. First of all, a word on the location. The Puente Hills Mall has certainly seen better days. Many stores stand empty, and if you’re so inclined, it would be easy to act out scenes from Dawn of the Dead or Night of the Comet here. Haunts all over the country seem to be taking advantage of the decline in retail, using abandoned stores as locations. Although this might be convenient and cost-effective, the mall setting does detract somewhat from the atmosphere as you wait in line. Gazing into the window of a Foot Locker while 90s music plays overhead just doesn’t get us into the haunt mood. HorrorWorld occupies three storefronts on the second level near Macy’s. The main store houses the ticket booth; spooky vendors selling everything from t-shirts, to Halloween masks, to home decor; and food vendors, such as Morbid Cupcakes and Rad Coffee (try the Cookies and Scream coffee!). It’s also the location of the asylum-themed maze. On the night we visited, this maze had its lights on. This actually might be the normal state of things, since it’s located inside the same room as the vendors and ticket booth, and we’re not sure how they could effectively dim the lights enough to work for both the vendors and the maze. Nevertheless, the actors were going full throttle inside. Demented asylum patients assaulted us around every corner and got right up in our faces. However, the overall set design did lack detail, as the walls were mostly just white with plastered papers and smears of blood. It was also a relatively short maze. But it serves as a good warm-up for the others, so if you get the all-access pass, we definitely recommend you check this one out first. The Fleshyard was previously located in Anaheim, most recently at a pumpkin patch, and over the years it’s earned a reputation as one of the best stand-alone, independent haunts in Orange County. This year, it’s found a perfect home at HorrorWorld. While we waited in line, we saw many groups run out of the exit looking terrified and/or exhilarated. We could tell from the guest reactions alone that this maze is special. The beginning of the maze was a dark church scene, where a distraught young girl knelt at the altar while the priest provided the backstory of the doomed Kearny family. After hearing what befell the family, we were soon ushered out and began our journey through the Kearny house of horrors. As we traveled through the dilapidated farmhouse, we encountered various family members. Some of the scenes included the living room, kitchen, and bedrooms. The maze also includes some “outdoor” scenes. We found the sets to be impressively detailed with effective lighting and sound to set the frenzied mood. The maze uses unique scare tactics, and although it was a preview night, these actors had the scares down already. There’s also a narrow hallway section that might have you turning sideways to get through (although there is an alternative, “easy” path for claustrophobic or larger guests). The finale scene was particularly impressive, and it’s what had some guests actually running out of the maze. The main attraction at HorrorWorld is still Into the Black. This maze takes up the largest space in the event and still requires guests to go through alone. However, the timed tickets from last year have been abandoned, and instead guests simply wait in line for their turn. This maze relies heavily on darkness to set the mood. Although they’ve done a good job blocking out most of the mall’s harsh fluorescent lighting, we did find some light leakage coming through the scenes at the very front of the maze. But instead of being a distraction, it actually allowed us to observe the amazing detail in the sets and masks of the actors. However, this affects only a couple of scenes, and as you travel to the back of the maze, the darkness quickly envelops everything once again. As we made our way through the crumbling Black family home, we encountered truly scary demons lurking around every corner (as well as in many other unexpected places). And these are no average demons…the amazing quality of the Bone Yard Effects masks gives them an extra unsettling, sinister appearance. Additionally, the maze uses a minimalist soundscape to heighten the suspense. The paths near the back of the maze are so disturbingly quiet, that any shuffling sound raises the hairs on your arm and puts you on full alert. The actors exploit this by moving nearly soundlessly until they are right next to you, or they may build the scare first by quietly scraping walls, finally letting out their terrifying shrieking growls right in your ear. Into the Black remains one of the best mazes in Southern California right now. If you didn’t catch it last year, this should be near the top of your list for 2018. In its inaugural year, HorrorWorld has entered the Southern California haunt scene as major player, and we highly recommend a visit. Although you can buy tickets individually for each maze, the best value is the $45 all-access pass, which allows you to experience all three mazes. There is also a VR experience (we ran out of time and didn’t experience it this year). HorrorWorld is open Fridays through Sundays in October, as well as October 29-31. Tickets are now on sale. Experience a variety of Haunted Attractions at Southern California’s Most Anticipated Halloween Event. Not only do we offer the Scariest Haunted Houses, but Horrorworld has partnered with a team of terrifying vendors to create a Truly Frightening Experience.